Here are all the best offers available this week, including a mountain-top retreat in Oman, a spellbinding stay on Thailand's Merlin Beach, the newest company for female solo travellers and exclusive deals on stopover holidays. When it comes to planning unforgettable and exciting holidays, there's no rule about keeping them to summer time. With the right location and the right plan, you can have the time of your life at any time of the year. In fact, some holidays are better suited away from the balmy nights and days of summer, such as a joint getaway to New York and the Bahamas for Christmas. Also available is a rollicking trip through Las Vegas and Music City Nashville holiday and a tailor-made Western Discovery Escorted Tour that breezes through Los Angeles, Phoenix, the Grand Canyon and more. Tropical Sky are offering massive savings on five nights at the 5 star Anantara Al Jabal Akhdar Resort, which costs from €2,399 per person. This stately mountain-top retreat is modeled on the ancient forts that dot Oman's landscape, ensuring you holiday like a king or queen. 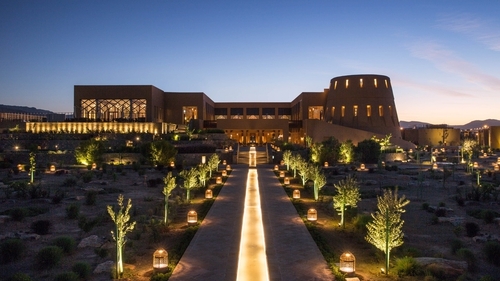 Take in the stunning scenery with an infinity pool, then saunter over to the hammam offering Arabian cleansing rituals, and classes ranging from hot yoga to cookery. Whether it's the heady cities or the tranquil beaches, Thailand is a truly spellbinding country. With Tropical Sky, you can luxuriate on a seven-night stay in the 4 star Phuket Marriott Resort & Spa, Merlin Beach from just €849 per person. Located right on the Tri-Trang beach overlooking the Andaman Sea on the southwest coast of Phuket Island, take your pick of three swimming pools, massages in the spa and sunset-watching. Dubai and Thailand are magnificent locations to visit on their own, with rich cultures and incredible experiences that are totally unique to them. For this reason, it can be hard to decide which one to choose if it came down to it. Agonise no longer, as with Tropical Sky you can get the best of both worlds, with a five-night stay at the 5-star Anantara The Palm from just €889pp. You'll get white sandy beaches, the option of private dining and an outdoor spa. If you need space to yourself, you can't go wrong with kicking back on 2,500 of incredible flora and fauna in Mauritius. With Tropical Sky, get seven nights at the 5 star Heritage Awali Golf & Spa Resort when travelling between 15th September and 7th October, from just €850pp. Located in the Domaine de Bel Ombre, with its crystalline lagoons framed by tropical flora, enjoy everything from a wide variety of sports activities to the Seven Colours Spa, where you can relax in the sauna, vitality pool and other treatments. If you're looking to fit in more sightseeing on your trips, stopovers are a perfect way to do that. Hayes and Jarvis are offering free stopovers on a range of trips, such as an epic tour through Japan with two nights in Hong Kong, nine nights in Koh Samui with two in Singapore, seven nights on safari in Kenya with two in Doha, and more. Who can deny the buzz of a group holiday? Whether it's with family, friends or even a travel group, some of the most memorable trips are those spent with like-minded people. If you're looking for a group holiday destination, skiing is ideal, and Crystal Ski has a range of benefits for group bookings such as discounts on trips to Italy, France and Austria and free standard skis with lift pass purchased for groups of 10 or more for February 8th, 2020. The report from the inaugural UNWTO Mayors Forum for Sustainable Urban Tourism was released last week, which saw discussions about the importance of protecting cities when tourist numbers swell. AerClub is now allowing members to save money on the cost of their flights by introducing ‘Pay with Avios’. Through the initiative, AerClub members can collect Avios ‘in the air’ each time they jet off, as well as ‘on the ground’ with SuperValu, Kildare Village, Aer Credit Card and ‘online’ via the AerClub eStore. Game of Thrones-related tourism is a booming industry in and of itself, so it's no wonder another experience has hit the market. Klook, the Hong Kong-based tour platform, has introduced a range of thrilling Game of Thrones activities, including tours of the ancient city and a wander through the stately halls of historic Lovrijenac Fortress. More women than ever are traveling alone and living their best lives, but the influx of stories about female travelers and violence or misfortune could dissuade women from setting off on their own. Owner of Elle Voyage, Dawn Simone, once felt discouraged by the lack of a traveling companion and has curated a tour for solo female travellers. Elle Voyage aims to get more women to travel with group tours carefully selected for women.